Virtual power plants (VPPs) for small, distributed power generation have become a fixture of Germany's electrical grid. While their numbers remain in the low thousands, VPPs withstood a five-year trial period in the electricity market. Now, with falling battery prices, they are beginning to change the nature of the grid. Though the name sounds futuristic, the VPP concept is nothing more than the use of computers to link small, individual decentralized power-producing systems into a larger system. Controlled together, they can mimic the operations of an entirely new power plant without the logistics and expense of actually building one. VPPs can be harnessed to help meet the ups and downs of grid power demands, especially the fluctuations posed by solar and wind power. Two studies by Germany's Fraunhofer Institute have shown the technical feasibility, both on the power generation side and in terms of overall grid stability. Proponents say VPPs could be scaled up to provide the whole of Germany with a stable electricity supply from 100 percent renewable energy. They can serve both as a power reserve or as a balancing source that can keep the grid humming. Fast-moving IT-energy service companies like LichtBlick (which means "Ray of Hope") are working to perfect the VPP business model. The Hamburg-based green energy pioneer first established the sector's mass-market appeal using biogas-fired, Volkswagen-built cogeneration engines introduced in late 2009. The 15-year-old company now boasts half a million green energy customers, served by a thousand of these units, whose output of combined heat and power is remotely controlled, collected and distributed via a VPP. The appeal of the process is spreading: Both Sonnenbatterie, a German energy storage manufacturer, and Tesla, the U.S. battery and electric car producer, have signed deals to have their products linked to the LichtBlick VPP. Global clean technology markets specialist Navigant Research estimates that by 2023 the VPP sector's annual revenue worldwide could reach $5.3 billion as VPP capacity quintuples, growing from 4,800 megawatts in 2014 to nearly 28,000 MW. What's driving the sector is a convergence of trends that include increasing penetration of smart grid technologies, growth in renewable generation and emerging markets for ancillary services. "You could make the argument that Germany is the global leader," said Navigant principal research analyst Peter Asmus, noting the potential power from demand-side response generation and the game-changing prospect of linking rooftop solar arrays with storage batteries. Demand-side response refers to the use of electricity from big commercial power users, which can cut their power use by turning off lights or adjusting heating and ventilation systems, and get paid for feeding the power they've saved to the grid during peak demand hours. Because it can reduce the strain on the grid, it's the more profitable VPP segment, Asmus said. 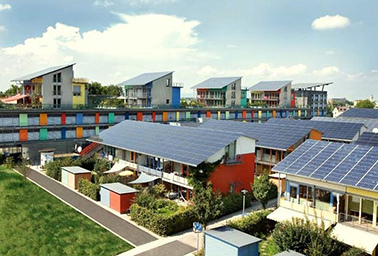 A solar-powered community in Freiburg, Germany. Add emerging home storage batteries and you have the makings of a "virtual power plant." Photo courtesy of Flickr. The United States leads in demand response. Europe -- Germany and Denmark, in particular -- are forging ahead on the far more complex distributed generation side, where thousands of small power sources are scattered over large areas. Aggregate them intelligently into a controllable power generator, and VPP backers say the result will be pretty close to what a grid dominated by renewable energy sources will look like. Once linked to LichtBlick's control platform, Tesla's "Powerwall" storage batteries will be able to draw excess wind and solar power from the electricity network, and then, during calm or cloudy periods, feed it back into the network. According to the press release issued late last week, consumers who integrate their batteries into the VPP will then benefit from revenues earned through LichtBlick's energy trading desk. LichtBlick founder and CEO Heiko von Tschischwitz hailed the Tesla battery, calling it a "key technology" enabling a "revolution" in distributed energy. Yet with Germany's prices for solar now dropping below retail power prices, analysts say the primary incentive for investing in integrated solar batteries lies in the savings that homeowners and small businesses can achieve by generating and storing their own solar-powered electricity. Storage can boost on-site consumption by up to 70 percent. Consequently, home energy storage companies, like E3/DC and Sonnenbatterie, have recorded big sale bumps over the last two years. The business model for LichtBlick, then, lies in persuading customers to give them some of this stored capacity -- either for pulling energy from the market or for selling into it at the right time to make money. "What our software platform does is at every moment search out electricity that's being produced or stored to find the most economic way to use this energy," said LichtBlick spokesman Ralph Kampwirth. "With this intelligence, the price [in the market] gives us the right signal." Acting with such speed and agility is no small accomplishment. It requires software and operational know-how, with highly sophisticated algorithms actively controlling renewable energy generation in real time so that changes in conditions at one part of the grid can be immediately compensated for by production from other parts, explained Jan Aengenvoort, a representative at Next Kraftwerke. An IT-energy company based in Cologne, Next Kraftwerke has 2,800 renewable energy power plants mostly with farmers running CHP engines linked to wind, biogas, hydro and solar generating units. Its Next Pool VPP presently manages an aggregated decentralized capacity of 1,600 MW, roughly the capacity of 1½ large nuclear power plants. For 2014, the company reported $202 million in turnover. Its volumes are principally generated by selling balancing energy to Germany's four Transmission Service Operators, and by offering short-term flexibility on the electricity spot market. Some utilities are also working with VPP solutions, though this has largely been confined to the management of their own large assets. Retrofits of wind farms, for example, entitle the operator to a "remote control bonus" payment under Germany's market-premium support mechanism, and are a precondition for combining wind farms into virtual power stations. The big four utilities -- E.ON, RWE, Vattenfall and EnBW -- have a hard time competing with more localized municipal utilities that are closer to the distributed assets, says Rolf Wüstenhagen, professor for management of renewable energies at the University of St. Gallen, a business school in Switzerland. "New entrants like Next Kraftwerke and LichtBlick are not bound to their past history, so they tend to be much quicker than some of the utilities," said Wüstenhagen, noted for his work examining emerging business models in the field of renewable energies. Municipal utilities can easily convert larger 1-MW cogeneration CHP engines into VPP networks. By contrast, on the residential side, the going is far more challenging. LichtBlick, for example, recently ended its relationship with Volkswagen, scrapping its mini-CHP offer after failing to sign up enough customers. According to Wüstenhagen, one of the main hurdles lay in overcoming a conceptual problem: Most consumers don't want to involve themselves with the sale of energy, nor with the complexities of combined heat and power generation. "The average consumer wants to have the lights on, and he wants there to be more solar in the system, but as conveniently as possible," said Wüstenhagen. By moving away from CHP to batteries, LichtBlick solves the complexity issue. Batteries are pure electricity products that people have used for some time now, Wüstenhagen said. Moreover, LichtBlick already has real customers, thanks to a package deal that steers consumers of a Sonnenbatterie home system toward the LichtBlick VPP. So far, it's too early to say whether the inducement -- a €100 bonus payment from LichtBlick and 1,100 kilowatt-hours of free power from Sonnenbatterie -- is enough to really make a dent in the market. Tesla's high profile will likely entice Germans to consider the LichtBlick VPP, but there remains a number of technical issues that still have to be resolved, said Edgar van der Meer, a senior analyst at the market research firm NRG Expert. For usage in a virtual power plant, it is essential that batteries have a very long lifetime because the storage system is charged and discharged more often than when using it only for self-consumption. Sonnenbatterie uses a very robust battery technology that it says ensures a lifetime of 10,000 charge cycles. There are also requirements in software and measurement technology that are necessary for the participation in a VPP that is already included in the Sonnenbatterie. If Tesla is going to make a big splash in the market, it may want to first knock on the door of VHP Ready. Formed in 2014 by a group of equipment manufacturers, energy providers and network operators, the trade body currently has 25 members, including E.ON, Vattenfall, 50 Hertz, Bosch, Younicos and Next Kraftwerke. The aim is to create common transmission standards that enable decentralized units to simply authenticate themselves. This would provide an opportunity for smaller assets to become economically viable, while also paving the way for wind and solar to fully join the VPP market. "Wind and solar are already integrated into German VPPs, but they're not optimized yet," said Juliane Schulze, a project leader at VHP Ready. Only the Netherlands and United Kingdom allow wind farms to provide ancillary services, and, consequently, the units are monitored and remotely switched on or off within VPPs, but the assets aren't yet being actively traded. LichtBlick recently agreed to join VHP Ready in what observers see as a good sign for the industry's evolving maturity, as competitors begin falling behind an open source code developed by Vattenfall. A viable VPP market is emerging, said Wüstenhagen, and, with falling battery prices and the entrance of companies like Tesla, there also exist new possibilities for consumer engagement on a scale not yet encountered. Still, a great deal will depend on IT-energy companies like LichtBlick. "They have been independent and courageous enough to do things -- and not only in the laboratory but in scale out in the field making substantial investments," Wüstenhagen said. "They have a track record working with customers," he added. Few incumbent utilities can say that.